I’ve been getting a lot of questions lately from people trying to decide which Nook Color alternate firmware to go with, CM7 or Honeycomb. 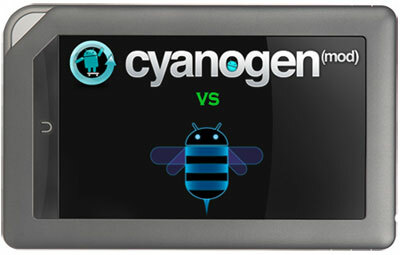 CM7 is based on Android 2.3 Gingerbread. Honeycomb is Android 3.0, the first version of Android designed for tablets instead of smartphones. Both have their pluses and minus, but one clearly outshines the other. First thing, you can try both to see which one you like better. If you don’t want to get 2 microSD cards, just install CM7 or Honeycomb, test drive it for a little while, and then if you decide you want to try the other you can erase the memory card by reformatting it and start over with another ROM (I use SDFormatter for Windows). From my experience, CM7 is the one to go with. Honeycomb is nice with all the widgets, streamlined interface, and on-screen nav buttons and recent apps list, but the ROM is based on the preview version of Honeycomb. It lacks features of the official Honeycomb release. Video does not work, sometimes the browser hangs, the accelerometer is iffy, and there are numerous bugs. CM7 isn’t as flashy or as fun as Honeycomb, but it is more stable and user-friendly. It runs smoother and has all the features of Android 2.3 and then some. It gets updates and improvements frequently, whereas the Honeycomb build doesn’t. Until the official Honeycomb ROM for the Nook Color comes along, CM7 is the clear winner. Will these both work on other android tablets besides Nook? I thought about getting the Asus Eee Transformer, but it does not have the official release of Honeycomb either. I’d go with an affordable tablet and get an android ROM of my choice. These specific ROMs won’t work on other tablets–they are coded for the Nook–but yes there are other versions for other devices. Here’s the CyanogenMod list. Not sure about Honeycomb, just a couple of devices have ROMs for it a this point. The Asus Transformer does come with Honeycomb. I’m actually testing one right this moment and am working on putting together the video review for it. I should have it posted by the end of today. Nathan, sorry to be off-topic but have you found a video player (of files) that allows you play videos in the background? We have had similar discussion regarding streaming video and flash, but I have just recently started play some video files on the device itself. Well “No Video Player” works. It appears to be a utility that works in conjunction with your default video player. It should do the job. Let me know if it works well. Google’s search for Market is so screwy. I type in “No Video Player” and turns up 18th on the list. The app I had noticed was “TV Shows Stream”, which oddly enough turns up #2 in the No Video Player search. Yeah it is weird where it shows up on the search list. I have used it a couple times now and have had no problem with it. I think it is cool that it has a button that allows you to switch from audio to video mode. One downside is there doesn’t appear to be a way to exit the program gracefully, so I use the task manager. I have Honeycomb installed but it won’t let me put the kindle reader on it or adobe reader software. My ultimate aim in getting the Nook was to be able to have all my reading materials on one tablet. I can download the nook software. Will CM7 Allow those apps to work? Not sure why those wouldn’t be working. I’ve got the Kindle and Adobe app on the Nook Color Honeycomb ROM. They work with CM7 too. I was able to download the kindle but when I try to register it, it gives me an error I called their support and it is registering there but isn’t getting that on the nook. I tried looking for adobe reader, or digital editions and when I find them they are greyed out and won’t let me download. Any thoughts on this? I got disgusted and took out the card for now. Am trying to decide if I want to format another card and go with CM7. I have CM7 on my NC….GREAT…Easy to set up…Fun. However, in order to read Kindle, B&N books, I must be on WiFi. When I reboot to normal NC I can read B&N books and Kindle converted books when off of WiFi. I would like to do this on CM7. Am I missing something? How can I ssore these books on the 6G data partition on the MicroDisk? I installed CM7 over the weekend. Overall, I’m impressed and I thank you for providing the instructions that were simple to follow. But, I’m a bit confused – isn’t this OS tailored specifically to the NC? I’ve noticed a camera app and some 2G/3G settings, neither of which the NC is capable of. Also, the DSPManager doesn’t seem to work. Is it possible that I grabbed the wrong build? Mine is update-cm-7.0.3-encore-signed. To clarify, when I say that the DSPManager does not work I mean that I am unable to alter the sound played on a headset. This bugs me because one of the things that the stock NC s/w disappointed me on was that the music player did not have an equalization capability, even though the TI DAC used in the h/w, I believe, has this capability. Next, I hoped that a better music player might be offered in the marketplace, but this did not happen. Does your DSPManager work? Again, my build is update-cm-7.0.3-encore-signed.zip. Is the word ‘update’ in the name signify anything significant? I noticed that your said ‘full’. Hi everyone, thanks for the comments. Sorry, but I don’t have the answers to your questions. I’m on your side of the fence: I installed CM7 on my Nook Color but I don’t know any more about it than you guys do. I’d suggest trying the CM7 thread at the XDA forums where there are a whole bunch of knowledgeable people on this specific subject. Suppose that I’ve installed a version of CM7 and want to update it to the latest some time later? Do you know if I would have to re-install all the apps and settings that I’ve made, or is there a way to avoid this? Boot from the SDcard in the recovery mode (see above) and the new snapshot would be installed. The partition layout would be preserved, filesystems are NOT reformatted, so your data should be safe. Thanks for the info. BTW, I’m sending this from my CyanogenMod7-hacked NC! I have to agree with you that this much nicer than the NC software. Also, when I originally installed the OS, the zip file that I used had ‘UPDATE’ in the name. It seemed to install w/o difficulty. Do you think this could cause problems? No idea. Deeper-blue is still working on it. He posted a video a couple of weeks back in this thread at XDA.